Beautifully Invisible. Beautifully Versatile. Beautifully Engineered. Beautifully Versatile. Air Diffusion's FlowBar is an architecturally designed high capacity linear slot diffuser. The flexibility of the system can blend into a design or provide contrast with its striking but simple design. The FlowBar system satisfies the requirements for designing an air distribution system that will maintain optimum room air conditions whilst becoming an integral component of the architectural concept of the project. In hard ceiling applications, a totally hidden appearance can be achieved with only a small slot opening. FlowBar is also loved by engineers and installers because it's not just a product that's easy to install; it's remarkably efficient and able to cope with unbelievable air volumes for such a small carbon footprint. FlowBar can be configured to your specification - we are able to curve FlowBar for a truly unique design. In addition, we are able to offer many other options and variants that include various end caps, end borders and mitred corners for ceiling and wall mounts. Continuous slot diffusers allows you the choice of using the air diffusers to complement your design. In this application, the designer has used Flowbar to discreetly allow air into the room and blend into the building architecture so it is almost hidden. FlowBar is designed to combine a very high air handling capacity with maximum flexibility and is suitable for either ceiling or sidewall applications. FlowBar has undergone extensive testing and has a large dataset, to ensure we are able to provide you with advice on choosing the correct product for your application/air volume. All FlowBar diffusers are manufactured entirely from heavy wall extruded aluminium, ensuring a straight and true installation. Our high throw model is designed for ceiling applications & the jet throw model for wall applications. FlowBar is available curved which allows the creation of stunning visuals that were never before possible. The subtle yet expressive FlowBar diffusers were chosen for the Eurostar Gare du Nord sophisticated Business Premier Lounge. 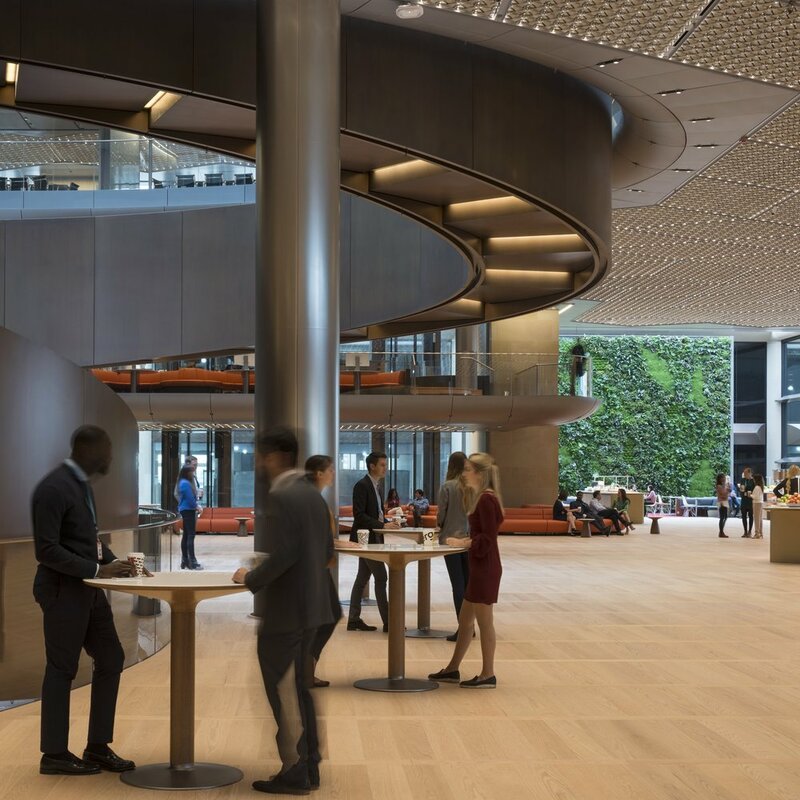 A bespoke design of FlowBar was specified for the new European Bloomberg HQ in London, adapted to fit a special application to run inside the ceiling lighting channels of the foyer. The innovative FlowBar is enhancing the stunning refurbishment of Whitworth Art Gallery in Manchester. A prominent building, situated along the east end of London's South Bank, has undergone a thorough refurbishment, with FlowBar diffusers fitted to a number of balcony rooms on the hotel floors of the building. Our technical expertise means we can help transform the projects you're working on today, into some of the most beautiful ceilings in the world tomorrow. Get in touch with us to talk to our FlowBar experts who will advise you on application, technical specifications and customisation options available.